The award-winning actor, writer, director, producer, Alan Alda has been named the 55th recipient of SAG-AFTRA’s highest tribute: the SAG Life Achievement Award for career achievement and humanitarian accomplishment. 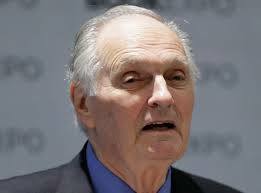 Given annually to an actor who fosters the “finest ideals of the acting profession,” Alda is one of only six people to receive Oscar, Tony and Emmy nominations in the same year. The actor who will next be seen in the as-yet untitled Noah Baumbach project starring Scarlett Johansen and Adam Driver, founded the nonprofit Alan Alda Center for Communicating Science at Stony Brook University in New York, which has trained over 12,000 scientists and medical professionals in this country and abroad. He also recently launched Alda Communications Training, the proceeds of which support the Center for Communicating Science. Nominated and voted on by members of the SAG-AFTRA National Honors and Tributes Committee, the Life Achievement Award is given to individuals for outstanding achievement in fostering the best ideals of the acting profession. Alda will be presented the performers union’s top accolade at the 25th Annual Screen Actors Guild Awards, which will be simulcast live onTNT and TBS on Sunday, Jan. 27, 2019, at 8 p.m. (ET)/ 5 p.m. (PT).